It would seem that I've been a good boy all year as Santa was good to me and my smart this year and I wanted to share my wonderful Christmas news I received today. Rob Tokar the Editor-in-Chief at TOKYOPOP confirmed today that they will be going ahead in creating me and my smart car (forfiveone) into cartoon characters for the upcoming issue of Grand Theft Galaxy (volume 2). I knew that I was going to be part of the cartoon world but today was completely floored with excitement when Rob let me know that they will be also including my smart car as part of the story. Rob did have some ideas in his email I will have some discussions with the creator of the comic in the New Year to work everything out. 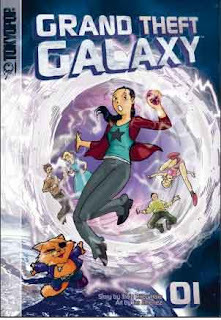 Grand Theft Galaxy (volume 2) will be in comic book stores November 2008, so it’s a ways off but will keep you posted and with the timing it probably will end up being what I send most people for Christmas next year. So if you want a copy you better be nice all year or Santa won’t send you one. For those who have never heard of TOKYOPOP it’s the US company that bought rights to reproduce and create English versions of Japanese’s comics, which are not actually called comics but “manga”. Manga simply means comic book in Japanese, but most people refer to even the English comics created as manga due to the fact they share a unique visual and drawing style. I am a fan of manga and comics in general and I originally talked with TOYKOPOP to be part of the Initial D comic series as they own the rights to that and since I was a big racer and car fan it was a really great tie in, but they don’t produce Initial D comics frequently and Grand Theft Galaxy was a wonderful selection by Rob. Wondering why someone like me gets the wonderful opportunity like this, it actually comes from my philanthropist background and my support of the St. Jude Children’s Research Hospital. While I have no children of my own I do what I can to help those who are fortunate enough to have children but require the help of St. Jude to ensure the long and happy life they deserve.